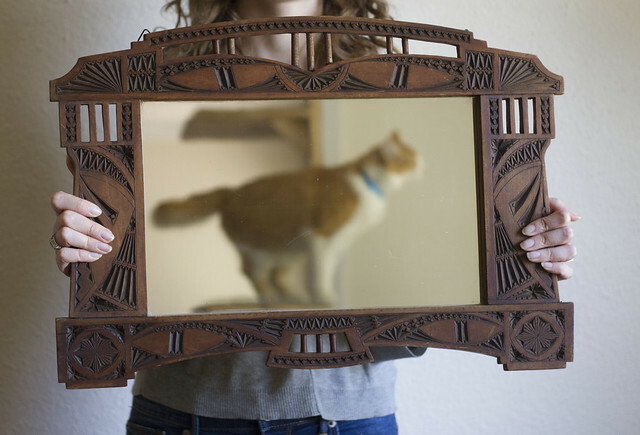 Up top is an incredible mirror I got my mom as an early mother’s day present (and also, Pip, pretending to be majestic). It’s so precisely carved and in such intricate detail that you hardly notice what it’s reflecting. I wanted to keep it for myself, which is probably a sign it’s a wonderful gift, right? We got an unexpected package in the mail containing eight superlative juice glasses, a belated christmas gift from some dear friends. I’ve kept two out for daily use, but the rest are tucked away safely. 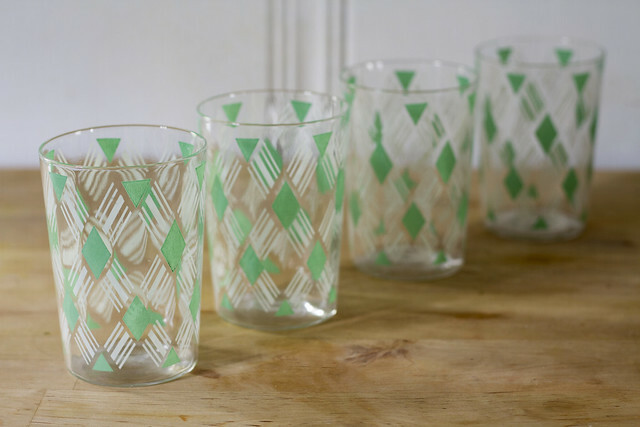 They’re nearly too pretty to drink from. 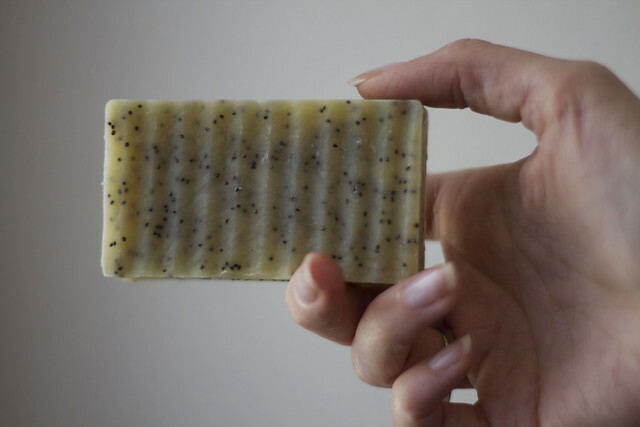 To make it lemon-poppy seed, I added 1.5 oz lemon essential oil and a quarter cup of poppy seeds at trace. It’s got an excellent lather and it smells like dessert. 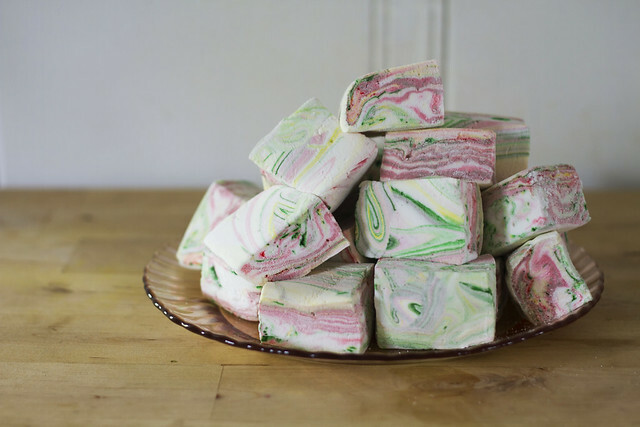 Nick had the genius idea to partially swirl food coloring into a batch of marshmallows, and my only regret is that nobody thought of it sooner. The ribbons of dye formed technicolor striations and made for some trippy looking s’mores. – I’ve made this cake twice in as many weeks, and I already have plans to make it again. It’s that good. – My antique mall luck has been off the charts lately– I’ve had my eye out for one of these for AGES, and I finally found one. – I’m spending every second there’s cool, breezy weather listening to mountain man with the windows open, trying to enjoy this season before the onslaught of summer heat. Bonnie will always be associated with this mustard-yellow color in my mind, so I knew I’d be making this sari into a tank for her. I didn’t bother with a selvedge edge at the bottom of the shirt, but I cut a little square out of a differently-patterned section to make a contrasting pocket. She also got a coordinating rope necklace. 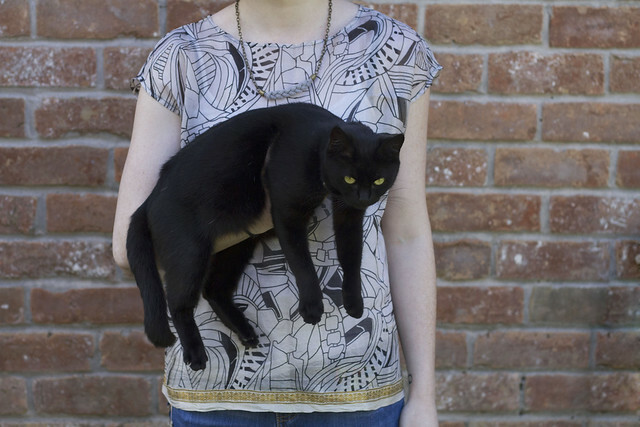 Both shirts were easy to put together, but I made sure to take my time– I get nervous working with a material so dear. – I scored this sweet card for my valentine while antiquing last month. – Today is dreary and overcast, so I’m listening to some equally gloomy music. – I really need a reason to make a batch of this today. Soap making has been on the docket for years, but something’s always stopped me from getting organized enough to make a batch. 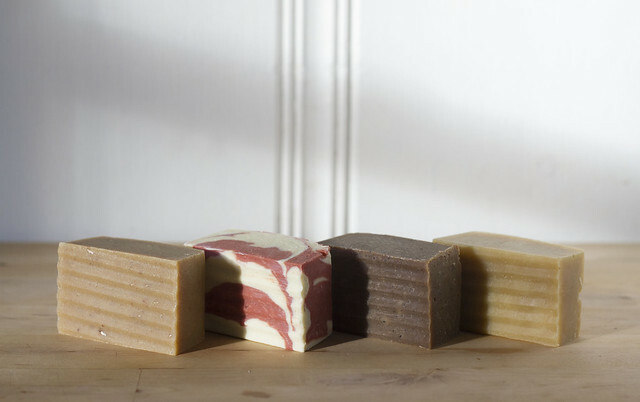 There are hundreds of cold-process soap recipes on the internet, and it’s hard to know which are reliable and simple enough for a beginner. I also knew I’d need to amass a small collection of dedicated cookware, measuring cups, utensils and thermometers so I wouldn’t end up mixing pancake batter in a bowl that once had lye in it. Speaking of lye, I was nervous about working with such a potentially dangerous substance– especially considering how often I manage to spill boiling hot tea on myself (more frequently than I’d care to admit). Nothing motivates me quite like the holiday season, so with the December deadline looming, I got to work. I used a similar base recipe for all the soaps, and subbed different liquids and additives to create each scent: goat milk, honey, & oat soap; peppermint soap; coffee soap; and beer soap. The peppermint batch was the only one I tried coloring. I’d hoped to achieve a vibrant red and white swirl, but the bright red I mixed up faded to a kind of dull brick-red, and when striped with an off-white, resulted in what Nick referred to as “bacon colors”. So, I still need a little practice coloring soap. 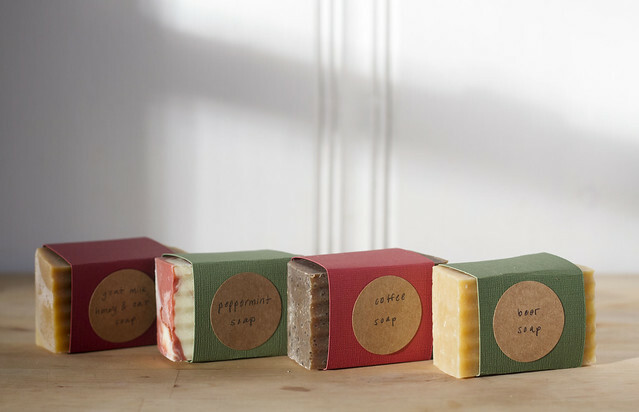 Because I wasn’t sure my soap experiment wouldn’t be a terrific disaster, I didn’t invest in a soap mold– instead, I spent a shockingly short amount of time saving empty quart-sized cream cartons and used two for each 5 lb batch of soap. After a day or two, the soap hardened and I peeled the cardboard off. These worked pretty well in the short term, but bowed a little when they were filled, which meant my finished bars were a little wonky. Each batch yielded 16 bars with a little trimmed off the top for testing. I used a crinkle cutter to give each bar a fancy rippled top. After the bars cured for a month, they were wrapped in paper sleeves, labeled, and handed out to family and friends. 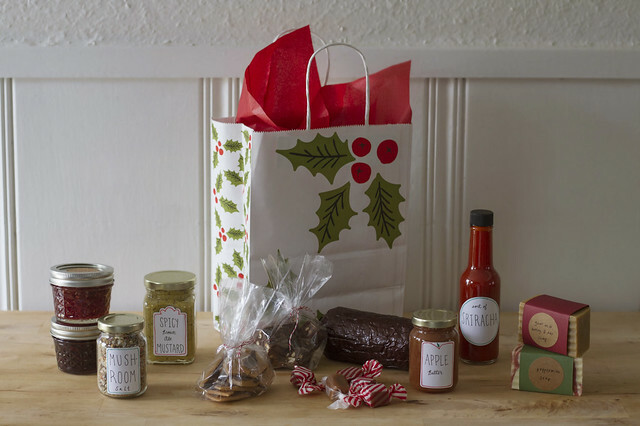 Although I do some kind of gift basket every year, I haven’t always done a great job documenting the contents. I’m usually scrambling to finish making components and end up sending them out the door before I can even snap a photo. This year, bad time management paid off, and by the time I was done putting everything together, a lot of the recipients had left town. Most everybody is getting New Year’s treats this time around, but that means I had time to break out the camera. Because I am a crazy person, I’d actually planned on doing more than this, but came to my senses when I looked at a calendar. The rainbow of macarons has been re-slated for next year’s gift bags. Something went totally awry when I calculated how much mustard I’d need to make, and I ended up with an insane amount. If you want some mustard, let me know! I will never eat it all and I need the fridge space. In the meantime, I am putting mustard on everything. -If you were wondering what the most beautiful mug in the world looks like, look no further (thanks, mom and nan)! -Finally my love of NPR and true crime is combined into one awesome podcast. -I have seen a lot of excellent movies lately, but this is a recent favorite. In an attempt to declutter, my mom showed up at my house with a couple boxes of old things, including a few of the ceramic pieces she made in college. 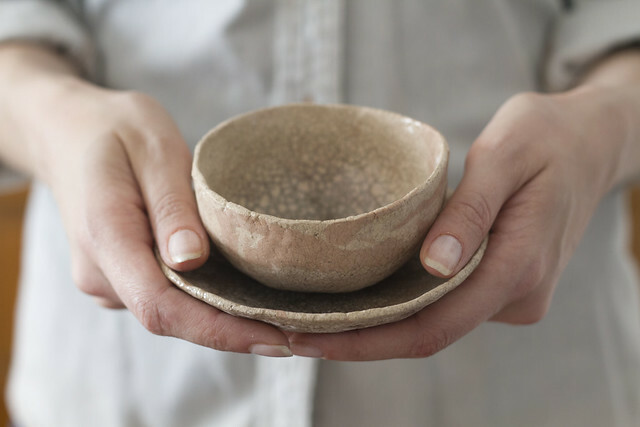 Most of these vessels were a part of the landscape of my childhood, and I remember regarding them with an awe and reverence that stemmed from more than just their relative fragility. I can’t believe they’re a part of my home now. 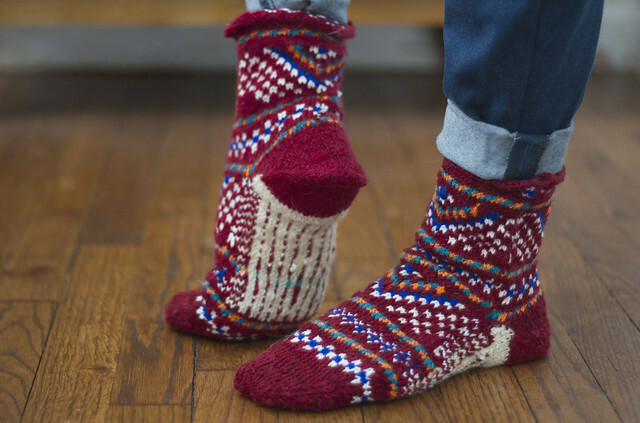 The beautiful socks in the second photo were hand-knit by an Albanian woman, and hand-selected for me by one of my worldly friends while traveling abroad. I put them on for the photo, but they’re much too lovely and precious to actually wear. I’m going to keep them someplace I can gaze at them adoringly. 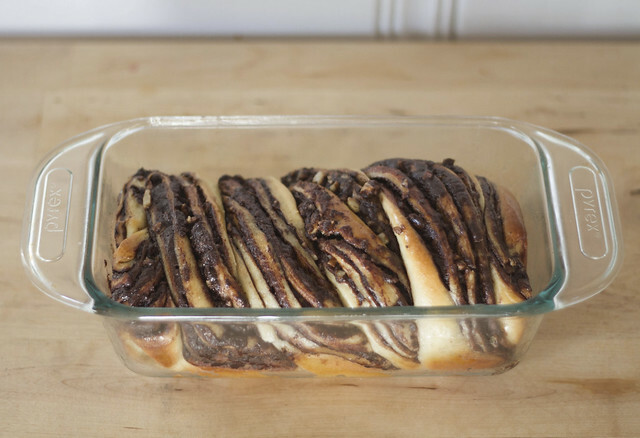 That krantz cake has been on my to-bake-list for well over a year, but the intricate-looking folds, two-day prep time, and final sugar syrup glaze made it look like too much of a feat. Allowing the dough to rest overnight seemed a bit fussy, but it serves to break up the active preparation, making this seemingly complicated confection much more manageable. The sugar syrup takes just a minute to make, and lends a glossy sheen to the finished cake. It bakes up buttery and rich, and the chocolate filling seeps out in ribbons, craggy with pecans. It’s just as delicious as it is pretty. 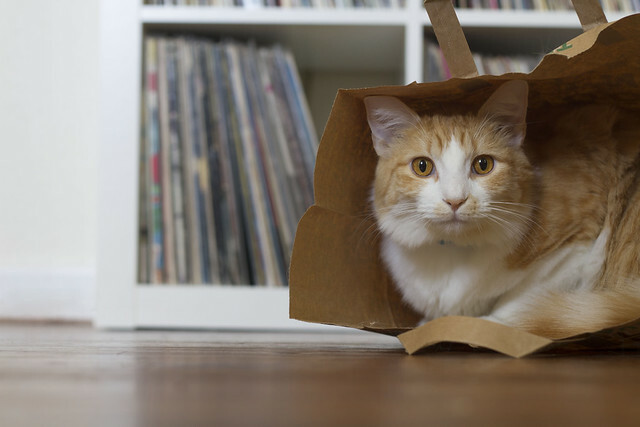 We discovered recently that when he’s not laying on top of my sleeping head or trying to climb my body in an attempt to perch on my shoulder, Pip is content to spend most of his time tucked away in a paper bag. His preferred mode of entrance is to run and dive inside, sliding across the hardwood floors and creating way more noise than paper should. I’m enjoying the recent drop in temperature more than I can say. Although it’s not cold enough for boots, scarves, and oversize sweaters (my favorite temperature), it’s cool enough that I can savor a cup of tea on the porch or drive around town with my windows down, blasting this from my car speakers. Some dear friends of ours are expecting, and I could not be more excited! They are awesome people who deserve equally awesome baby gifts, so I bought some soft yarn and some velvety pigskin suede and got to work. 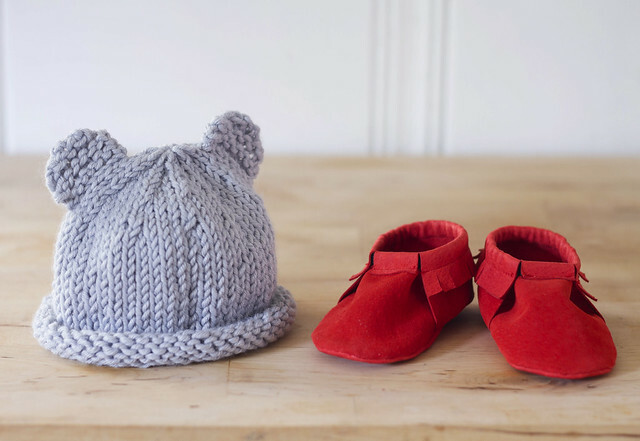 The baby bear hat is a super quick project– I stitched the whole thing up while watching a movie. The yarn I used was a cozy acrylic/wool blend that can be put through the washer, which is a pretty important feature of any knitted baby accessory. The moccasins are based on this pattern, which is easy to adjust for different sizes of little feet. I love the scalloped edges in the original pattern, but I wanted to make something a little less girly, so I redrafted the pieces so they’d have a simple fringe edge. This tomato-red suede is so beautiful! I wish I had some shoes made out of it. – I’ve got this bubbling away in the oven, and it’s making my house smell incredible. – This dessert was a huge hit and made use of some red currants I couldn’t resist buying. – Is it weird that I want to be best friends with this guy? 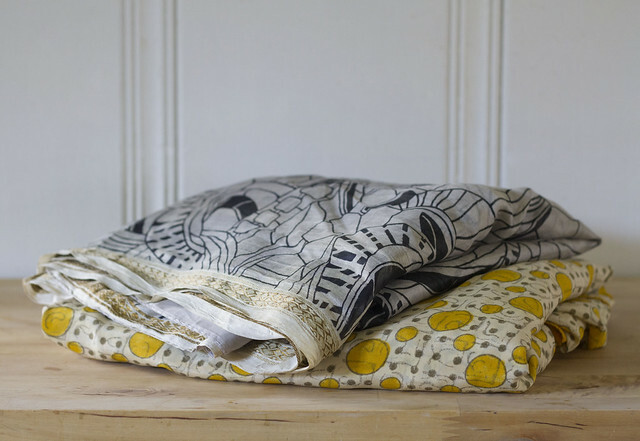 This checked linen was purchased on a whim and for years has been stuffed, forgotten, in my fabric stash. Last week I had a few days off in a row, so I decided to put together an outfit for a party on the weekend. 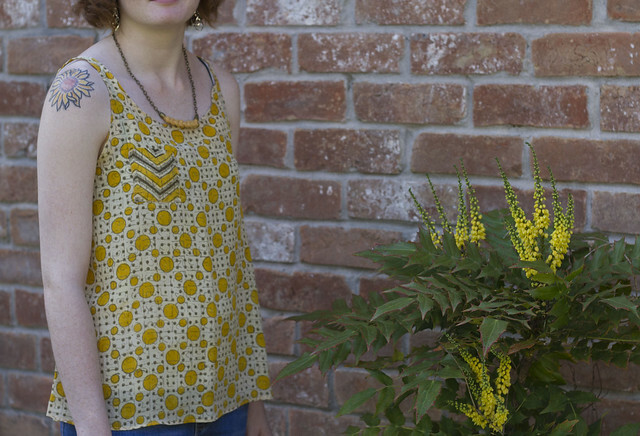 By some miracle, every element I needed for this shirt– from the pattern, the fabric, down to the notions– was already sitting on my shelf. I love it when that happens. 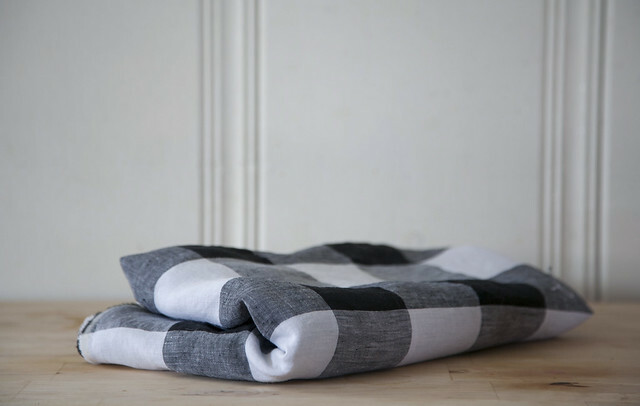 I finally wised up and realized that my love of linen is contributing to the amount of ironing I do on a regular basis, so the skirt is made of a linen/rayon blend that isn’t as quick to wrinkle and has an excellent drapability. I followed this pattern exactly. 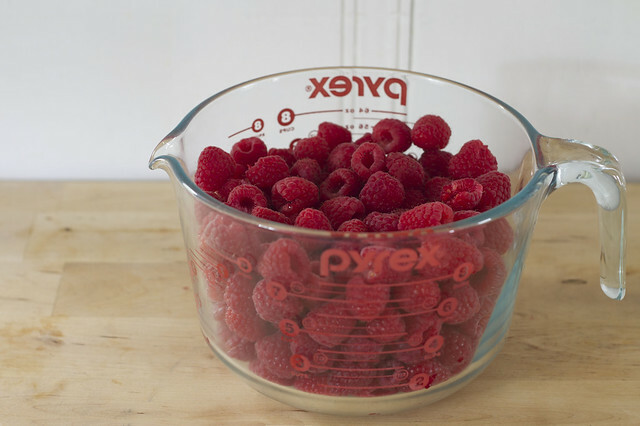 Every summer, for a day or two, raspberries go on super sale. You can pick up a 6 oz clamshell for 99¢, and the berries are sweet, juicy, and very, very ripe. I wait for these days all year long, and I spend every one of them gorging myself on my favorite fruit. This year, that period seemed to last much longer than usual, and I found myself making extra trips to the grocery store so I could cruise through the produce section and pick up more cheap raspberries. In spite of my constant berry consumption, I ended up with towering stacks of 6 oz clamshells in my fridge, and I knew I’d have to use them up soon– before they were lost to a fuzzy blanket of white mold. I managed to use a few cups in this cake, but it only made a small dent in my berry supply. 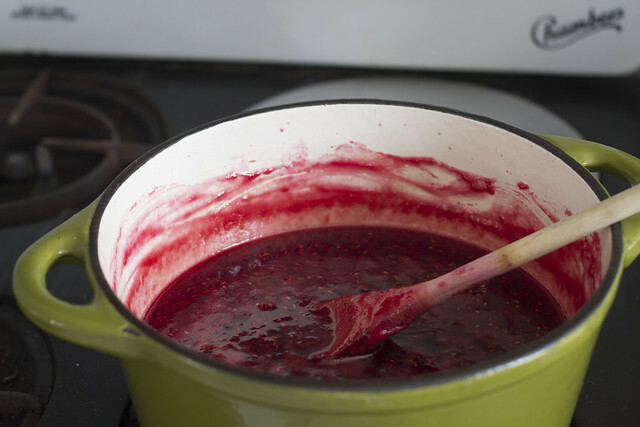 It was time to break out the dutch oven and make some jam. It’d been a few years since I’d last made a batch of jam, so although I didn’t follow it exactly, I referred to this recipe for instruction. The warm sugar trick is one I’ll keep in mind for all future jam-making. I ended up using about 8 cups of berries, 5 cups of sugar, and the juice of one small lemon. 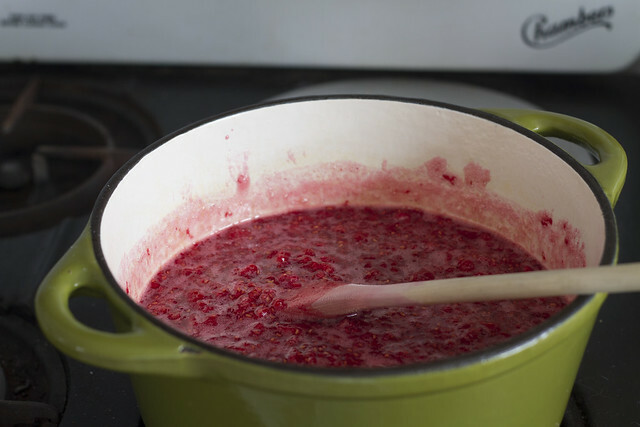 After a little while on the stove, the berries broke down completely, and turned into a thick, deeply scarlet syrup. 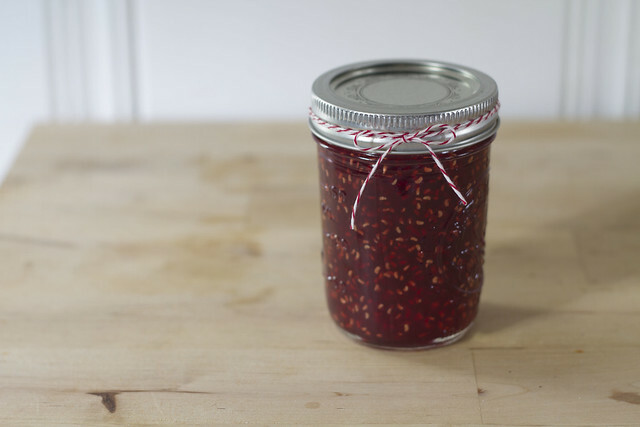 This is easily the best jam I’ve ever made– it was perfectly sweet, intensely fruity, and it gelled up impeccably. I ended up with six full half-pint jars and a little left over. I think I’ll hand a few out to friends and selfishly hoard the rest. Perhaps there’s a batch of linzer cookies in my future. – I got this album as an anniversary present from Nick, and it’s been playing non-stop. – This is both an effective and highly entertaining way of cleaning records. I rescued a favorite Billie Holiday album that no amount of felt-brushing could completely clean. – I’m excited to see this movie this week! Yesterday marks five years since I married my best friend. I’d planned an elaborate, masterfully crafted, homemade gift, but I didn’t stop to consider that my woodworking experience is limited to making canvas stretchers or that Nick is off for the entire summer, giving me no time for working on secret projects. 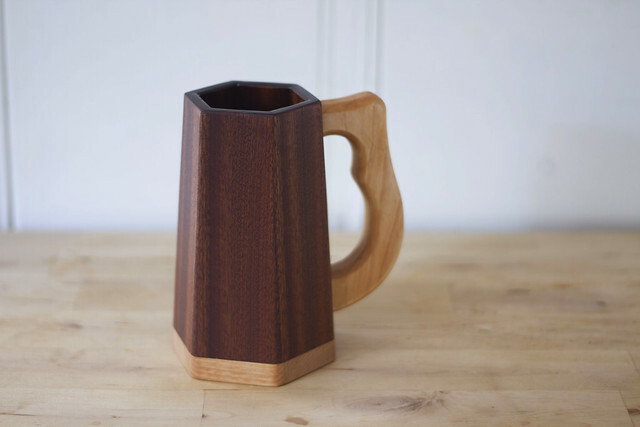 Instead, I scoured the internet for the best wooden beer mug I could find, and settled on this one. It’s maple and mahogany, and will hold 12 ounces of delicious home brew. 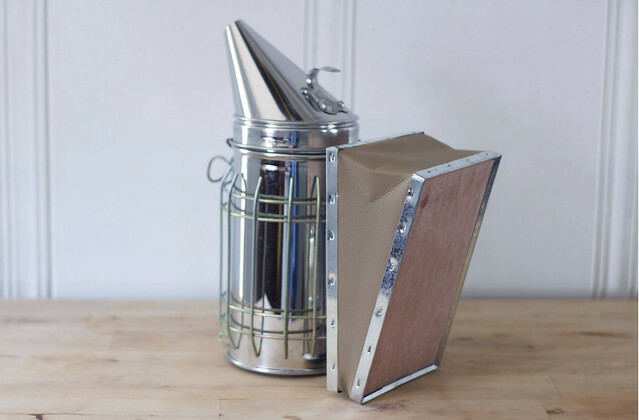 One of Nick’s gifts to me was this bee smoker with a wooden bellows. I won’t get to use it until next spring when we get our hive, but in the meantime, I’m geeking out over what a cool object it is. Incidentally, I’ve discovered that my cats don’t like air blown in their faces. The traditional sixth anniversary gift is iron, and I’m very glad to have 364 days to come up with an idea for that one. Although if they pass by as quickly as the last five years, our sixth anniversary will be here in no time! I can’t wait to find out what the coming years bring. Love you, old bean! For past anniversaries, click: one, two, three, or four. A friend and favorite coworker of mine has recently moved on to other endeavors, and as I did the last time this happened, I took requests for her farewell treat. 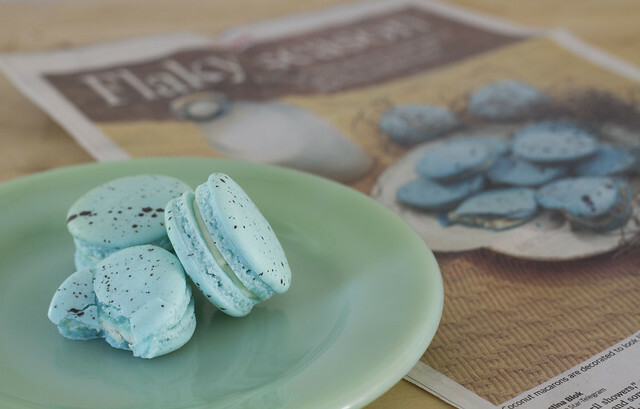 She had two: something with saffron, and blue, speckled, bird’s-egg macarons. The bird’s-egg treatment was inspired by a newspaper article featuring coconut-laden macarons, and while I didn’t follow the recipe or present them on a cutesy faux-nest of spanish moss, I think I nailed the dark brown speckles. I used my standard recipe and flavored these with the seeds scraped from a single vanilla bean. 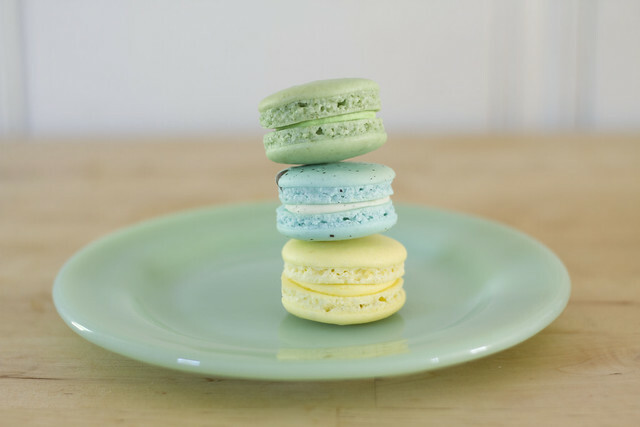 The saffron macarons got a heaping 1/8th of a teaspoon of saffron ground up with their dry ingredients, and the green tea batch was made with a tablespoon of matcha. They were a perfect send-off for a lovely lady. I’ve been spending my time reading in the backyard, enjoying the impossibly short flowering period of my favorite blossom, and soaking up every last second of spring, but I’ll be back with more soon.